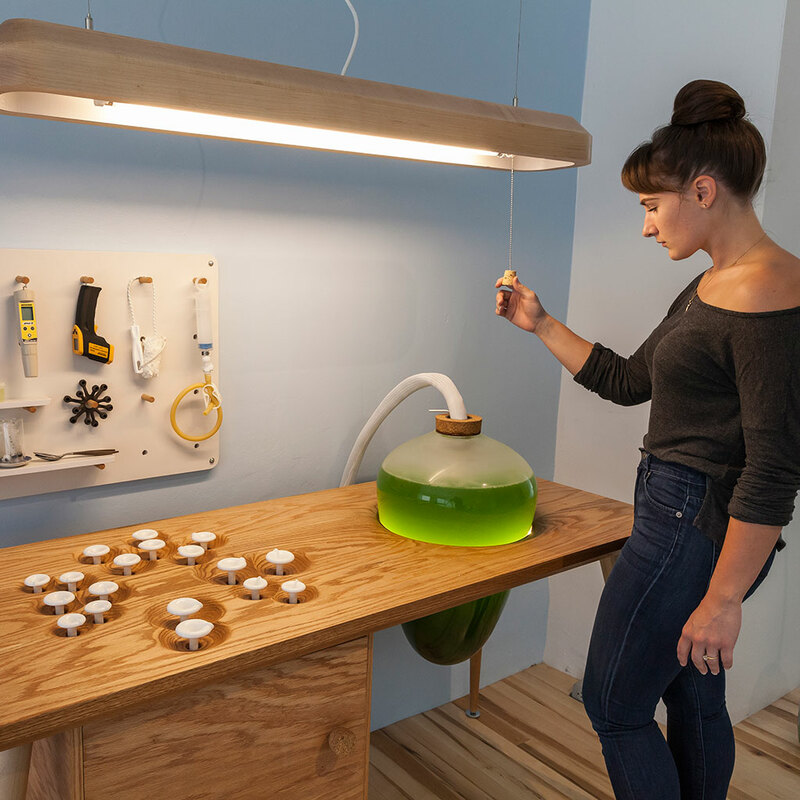 It might not look as pastoral as the herb garden sitting on your windowsill, but a new line of photosynthetic furniture could change the way we think about what we grow in our homes. The Living Things project, a collaboration between architectural designer Jacob Douenias and industrial designer Ethan Frier, utilizes microalgae called spirulina. High in protein and amino acids, spirulina has become a popular diet supplement over the last several years thanks to an abundance of headlines proclaiming it “the greatest superfood you’ve never heard of.” Users of Living Things furniture can simply turn a knob and get spirulina on tap. But in addition to being edible, the blue-green algae can serve a number of other purposes. Douenias and Frier designed several hand-blown glass holding vessels that look like they belong in a sci-fi epic. When full of healthy spirulina, the vessels can function as both light and heat sources for a home. For the two designers, though, the focus is on food. Douenias told Fast Company, “We’re looking at how we can produce supplemental food by recycling things we don’t need.” Those things we don’t need include waste heat and carbon dioxide from the air. Because the spirulina essentially feed on our waste, the footprint required to sustain them is considerably smaller than other indoor growing operations. There is still the matter of what spirulina tastes like. Douenias and Frier say it is mostly tasteless with just a hint of grass, which is not exactly a description that will get your taste buds excited. But the two are working with chefs and bartenders to create dishes and drinks showcasing spirulina in its best light. Unless you’re a soylent type, the furniture won’t replace your diet. But it does shine a light on a food source most of us rarely consider. Living Things is currently on display at the Mattress Factory in Pittsburgh.